Home » Education » School Pyjama Days. Weird or Wonderful? School Pyjama Days. Weird or Wonderful? As I write this, my daughters are attending their first “pyjama day” at school. To celebrate of yesterday’s World Book Day, and in lieu of dressing up as a favourite storybook character, the kids have been allowed to go in adorned in just their PJs. How does bedtime attire celebrate books and reading? It reminds children how important it is to have a daily bedtime story, of course. I’m fully in favour of this — my children already enjoy reading and bedtime stories and I hope this translates into a lifelong passion for books. What I’m slightly unsure about is why kids are being encouraged to spend a not-quite-spring-yet day in school wearing clothes they’d usually be tucked up in bed with. I understand it’s just a bit of fun, plenty of schools seem to do it, and the kids really enjoy it. Yet there are issues. By nature, pyjamas are not designed to be worn away from the home or for long periods outside the bedroom. For this reason, they’re not often designed to fit in the same way as regular clothes do, they don’t need to provide such a high level of modesty protection (coverage), and it’s not a problem if the materials don’t provide weather protection. Until your child insists they wear them at school. 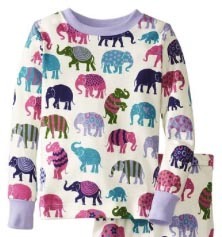 A perfect example was last night when our nearly-six-year-old daughter walked into the kitchen and announced that she wanted to wear these particular pair of PJs to school today — the bottom half of which was already heading towards her knees, supposedly without her knowledge, thus showing off her bottom. In the end, we had to take a late night trip to our nearest 24-hour supermarket to pick up some onesie PJs. Ones with a better-than-99% chance of maintaining our daughters’ dignities. I don’t know at what age pyjama days tend to stop. I can imagine it becoming increasingly awkward if they were still occurring during the teenage years. I also hate starting off down the paranoia/sinister/scaremongering road. I have no doubt my kids are just as safe at school today as when they go in their uniforms or PE kit. They’ll have a lot of fun and will no doubt talk about it excitedly at tea tonight. Yet there’s still something a little peculiar about it. Though it would’ve been more effort to have them dress up as fictional characters from their most-loved books, that would be more comfortable. What do you think of school pyjama days? Leave a comment below.